Forbes magazine recently had another one of its Best Real Estate Investing Cities list, and Texas did very well. Austin was listed as the #1 city to invest in, and San Antonio real estate investing came in at #3. Houston, Dallas and Ft. Worth also made the top 10 list. Some real estate investors have been pulling out of the Austin market, however, due to the high costs of real estate there. Forbes magazine gives us a clue why: The gross metro product for that city grew 24% from 2011 until the end of 2015, but houses there appreciated by 34%. Meanwhile, the average home price in Austin was $334,000 in 2015. So clearly real estate prices are seriously on the rise in Austin. That’s why many investors call me up and are looking for San Antonio investment properties. San Antonio real estate properties are much cheaper; you still can buy a good affordable fixer upper in San Antonio for $45k to $50k. And the average home price here is about $210,000. Given how much cheaper houses are here, there is lots of interest in San Antonio investment properties. However, you should note that days on market is longer in San Antonio than Austin. So what some investors who are interested in flipping under market value properties are doing is doing a flip or two in Austin and then doing buy and hold in San Antonio. As a San Antonio property wholesaler, I have flipped many properties in San Antonio TX over the years, but in this current market, we are seeing profits on our flips of $7k to $10k. And days on market can be 90 or 120 days. For that reason, I am not strongly seeking out fix and flip investors at this time. I will do them for the right property and right investor, especially if the investor has the cash to do 4-5 at once. That way, both of us can make a good profit. Also, if you are a patient investor, then a San Antonio flip can work well. Just do not expect a house to sell in 20 days like in Austin. I think the flipping market will get better in San Antonio once the market slows down in the next year or two. Address: 1723 W Ashby Pl San Antonio, TX 78201. 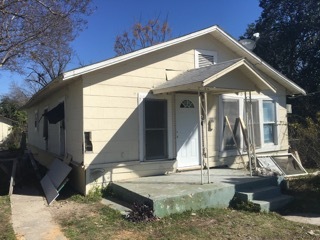 Description: Under market value property, investors dream north of downtown, 3 beds 1 bath, 1000 sqft, built: 1925, lot size: .19 acres, yearly taxes: $1,700.00, estimated yearly insurance: $800.00; estimated repairs: 50k in repairs to flip, includes new HVAC, updated kitchen/bath, flooring, paint in/out, exterior skirt, appliances, plumbing/electric up to code, paint out door storage exterior, trash, lawn maintenance. Exit Strategy: Owner Finance with 35K repairs: 5-10k down or more, ~$1295.00 monthly P/I, 30 year amortization, 10% interest. Or 15K rehab, new HVAC, paint in/out, kitchen/bath repairs, then FSBO at 105K, 10% interest, $1095 monthly PI/TI, 30 year amortization. Alternate Exit Strategy: Flip with $50k in repairs. $8000 to $10000 profit. I made the vast majority of my money in San Antonio real estate investing in buy and hold over the long term. Buy and hold in San Antonio is always a good deal because affordable homes seldom rise above 75k.